Kenilworth bounced back from defeat at Earlsdon, scoring six tries in a 36-14 win over Evesham at Glasshouse Lane, writes Sophie Freestone. The hosts went into the game looking to cement third place in the league but found themselves 6-0 down against their Worcestershire opposition with just under 15 minutes on the clock. Kenilworth managed to get a foothold in the match and Will Johnson opened the scoring for the home side after 22 minutes, going unnoticed by the Evesham defence to barge through and cut the deficit to a point. Evesham then worked their way into the Kenilworth half and extended their lead with a drop goal to make the score 9-5 as the half-hour mark approached. The hosts responded well, however, building momentum before Gaz Renowden crossed for his side’s second try of the afternoon. The experienced scrum-half spotted the tiniest of gaps in the Evesham defence to snipe over and nudge his side into the lead for the first time. The conversion from fly-half Alex Selby gave Kenilworth a 12-9 advantage. 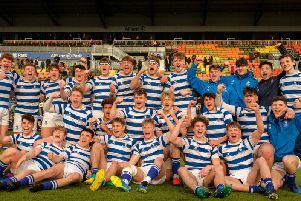 They extended their cushion on the cusp of half-time, winning a penalty from an Evesham five-metre lineout to set up a driving maul, with centre Charlie Stevens going over from close range. The conversion was missed. The hosts started the second half as they finished the first, scoring a try almost immediately. This time it was a fine solo effort from flanker Mikkel Andresen who showed his pace to break away from inside his own half to score in the right-hand corner. It was a further 17 minutes before Kenilworth extended their lead, Renowden taking a quick-tap penalty to touch down by the posts for his second try and the home side’s fifth of the afternoon. Selby added the extras to establish what would become an unassailable 20-point lead. The final quarter saw Evesham show their attacking intent, putting the Kenilworth defence under pressure on a number of occasions but it was the hosts who were able to finish off their opportunities. A great offload from captain Bobby Thompson to replacement Jai Purewal put Kenilworth into space to take them up to the Evesham line. Thompson then finished off the move by burrowing over from close range with 68 minutes on the clock. The conversion from Selby made the score 36-9. Evesham’s efforts in attack were eventually rewarded when they crossed for a consolation in the 80th minute after a sustained period of pressure five metres from the Kenilworth line. n Kenilworth Ladies’ unbeaten run in the league stretching back to the start of last season came to an end on Sunday with a 45-22 home defeat to Northamptonshire side Olney. It was Kenilworth’s first reverse since their fourth round Junior Cup loss to Reading Abbey over a year ago, with Olney opening up a 21-point lead mid-way through the first half. Full-back Phoebe Howles had crossed to bring it back to 7-5 but that was as close as Kenilworth got to their visitors. A penalty try on the stroke of half-time reduced the deficit to 14 but two tries inside the first ten minutes of the second half from Olney put the game to bed. Kenilworth provided spirited resistance and crossed again through Kirsty Davie and Sophie Henry but they were well beaten.